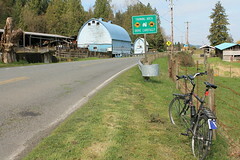 A rail-trail that’s popular with bicyclists in eastern King County has been designated as a National Recreation Trail by the Department of Interior and National Park Service. Growing up in Ohio and spending lots of time bicycling country roads, I’ve certainly seen my share of barns. Red barns. White barns. Weathered wooden barns. Barns with Mail Pouch Tobacco signs on them. But I’ve never seen a blue barn.